Liquidguru was created and is maintained by Kaj Maney. 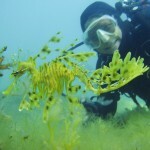 I am lucky enough to own and operate my own Dive Centre in Ambon, Indonesia, together with my partner Barb Makohin. We own Dive Into Ambon. Ambon is a world class destination for macro videography and photography. Since working in Lembeh I have become fascinated with the underwater macro world. The incredible variety of species that live in high nutritional tropical areas is mind blowing. I have had the chance to film many rare creatures and this is where I share my work. I hope I will introduce the viewer to a completely unknown world and share my amazement for the truly bizarre and weird creatures that have hardly been seen before. I was previously the Dive Operations Manager at Kungkungan Bay Resort (KBR) in Lembeh Strait, North Sulawesi, Indonesia. I spent eight and a half years working in the Caribbean, living in Roatan (Honduras), Dominica (Eastern Caribbean) and Belize (western Caribbean). I also spent two years in Tioman (Malaysia) and six months in Fiji. Since getting the video bug in 2002, I have been working of archiving as much of the underwater world as possible. Most of the critters I’ve filmed are with a Sony XR500 Camcorder. This is small enough to ge tinto places where bigger cameras can’t. Housing: Light and Motion Stingray G2+ – bullet proof housing, giving me access to all video controls.